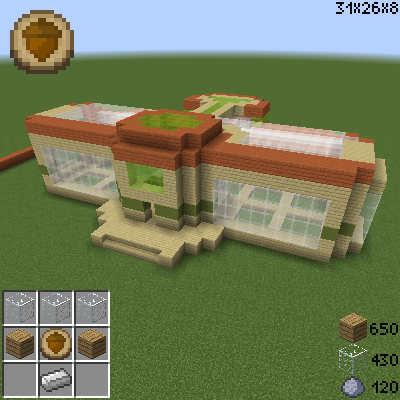 Archicraft is an automatic building and decoration mod for Minecraft 1.12.2. 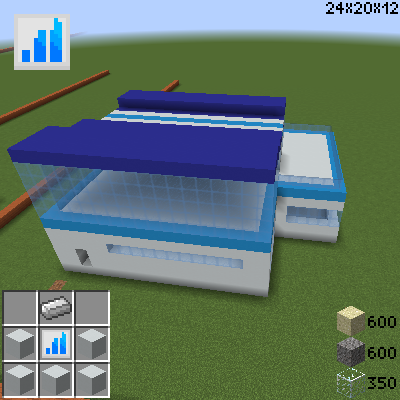 The mod have (5 planned, 2 fully implemented and another partially) different architectural styles with buildings and streets for all kind of purposes. 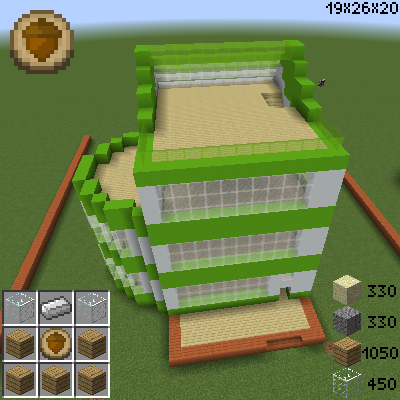 All of them are empty, so you can decorate them at will and adapt the building for your needs. -Arch: Tecnologic and futuristic. 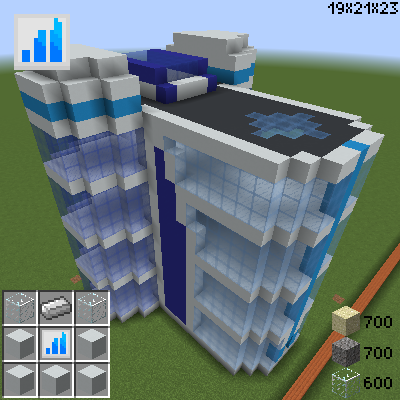 Mostly concrete and glass in white and blue colors. 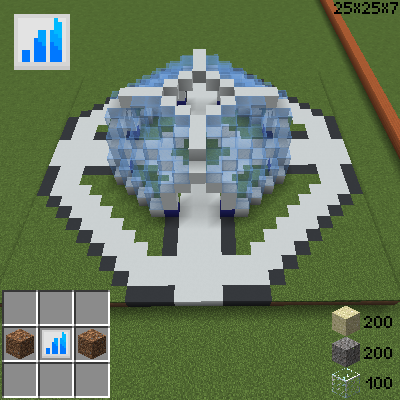 Inspired by futuristic designs and Arcology. -Luxark: Luxury, perfection and gold. ¿¿?? Gold, yellow, white and black. For mid or lategame. Inspired by Art Deco and Warframe's Orokin. -Alqaz: Desertic, decorated, andalusi/arabesque. 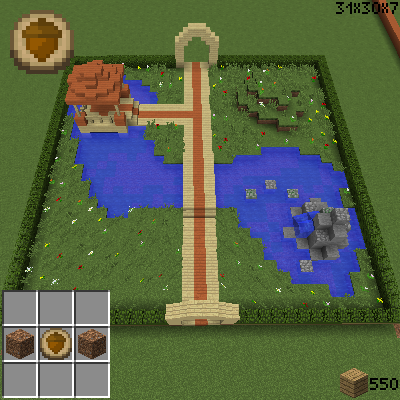 Mostly sandstone and clay with a bit of water, gardens, acacia and concrete in earth colors. -Okeanos: Artificial islands and subacuatic bases. 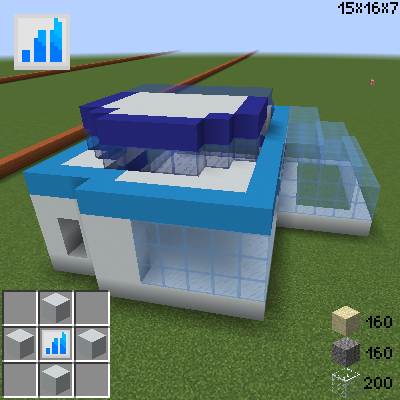 Mostly concrete and glass in white and blue colors. For late game. 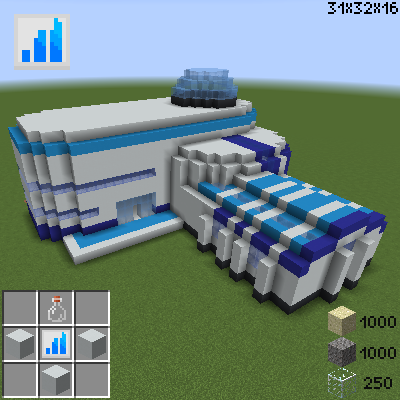 Inspired by Arcology and Subnautica. 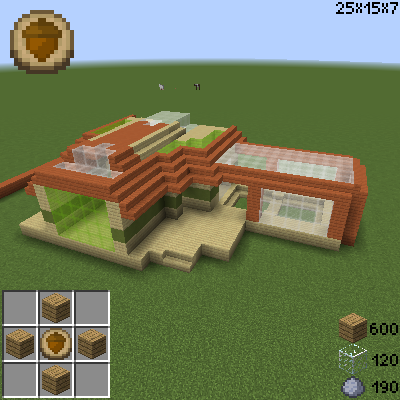 This mod was created to help the building process, so this is very easy. 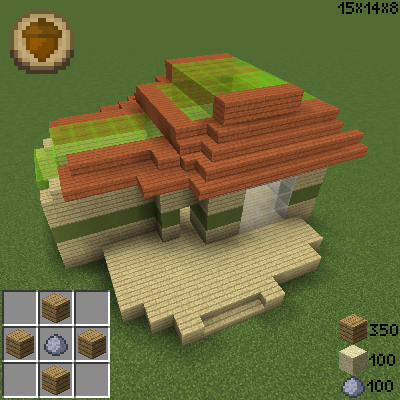 You only need to craft a token of the wanted architectural style, craft the block of the build you want, one chest and the required materials. Each craft yields 4 tokens. 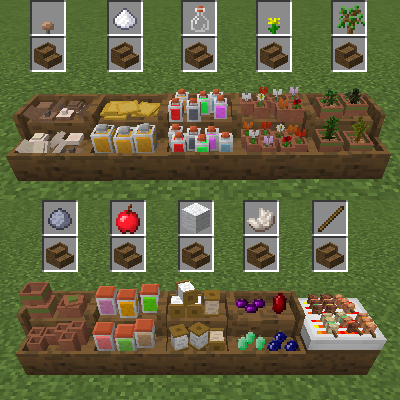 When you have the block of the building (see the pictures for the recipes), put it in the place you want and a chest on the opposite side to the building. One important thing to know is that the block is on the bottom left corner of the building. 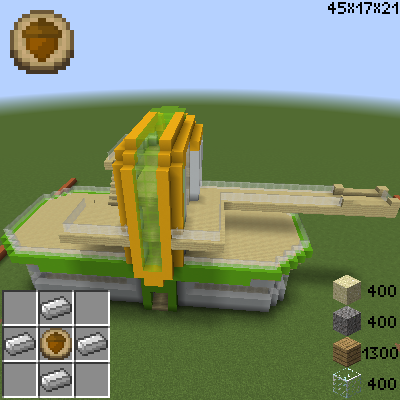 Then, put the materials in the chest and the block will get it. 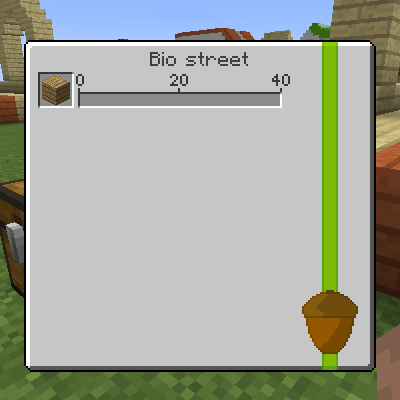 The GUI of the block will show the number of required materials and the number already in the block. 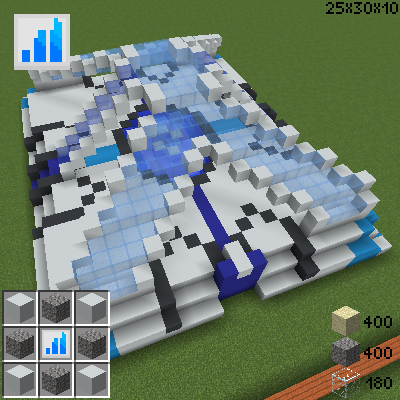 When the block have all the required materials, it start to build layer per layer until ends and then, destroys itself. 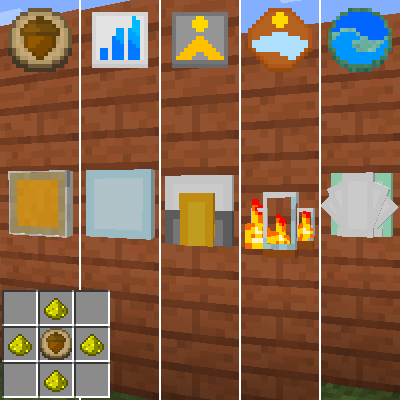 Two things to keep on mind is that the number of materials needed is less than if you build it, and it accept any type of multitype blocks like wood or planks, even from mods. 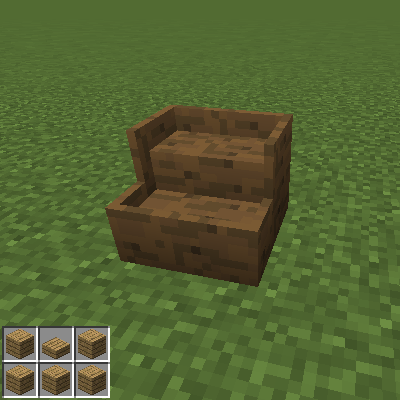 If you want to try/see the build, you can put a bedrock block in the first slot of the chest to start the building process. 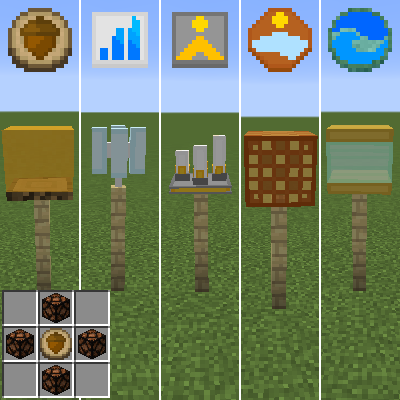 This mod use the Forge Ore Dictionary to set some materials, so can be changed to other similar from Minecraft or even from other mod. 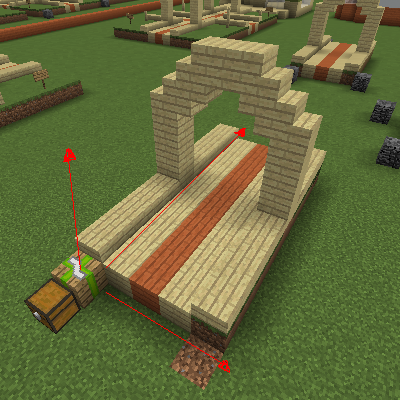 For examble, wood can be oak, acacia or other from a mod. 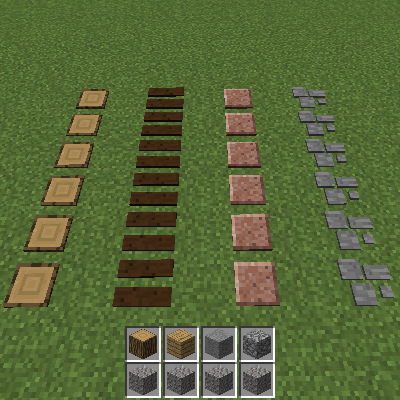 Those materials are wood, planks, slabs, dye and crystal. 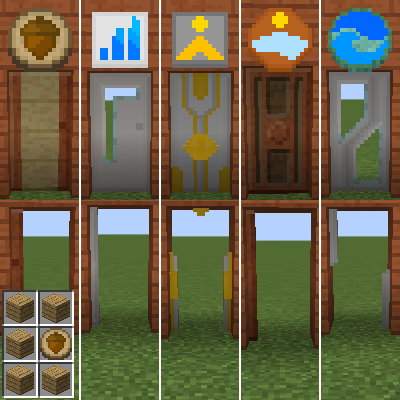 -Add this mod to a public or privated modpack, as long as you add the name of the mod (Archicraft) and credit me (Alfomega) somewhere in the description or/and the list of mods. 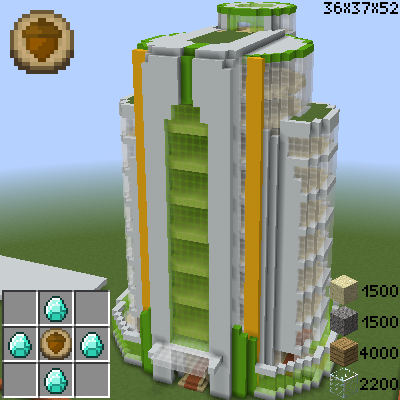 -Use the mod to do the buildings of a map or a server as long as you credit me (Alfomega), and say that the buildings was generated by my mod (Archicraft) with a link to the proyect in CurseForge. -Re-distribute, de-compile or sell under any circunstance. 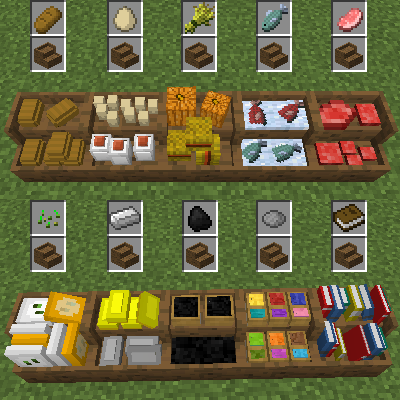 -Use it in a modpack or server which cost money to enter/get (Donations, Patreons, etc. are fine). You can contact me (in english or spanish) if you have any question, suggestion or you find a bug. 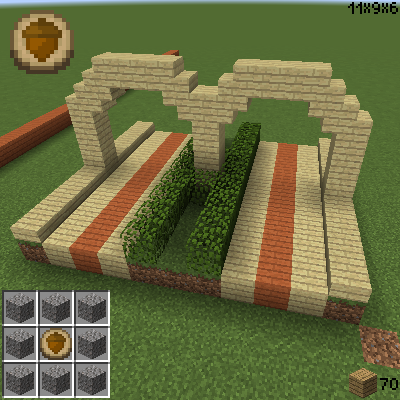 The Arch style is fully implemented now. 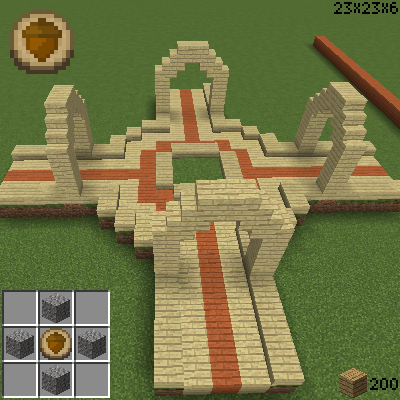 -Now the area of construction shows the middle of each side. 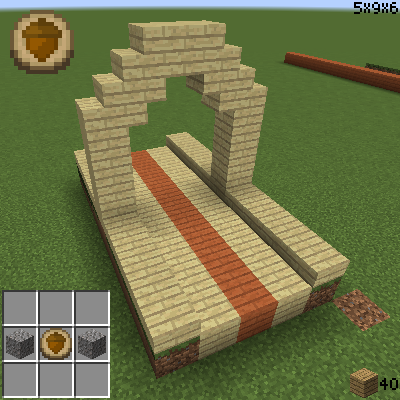 -Now the building blocks shows the area of construction if you look at them. 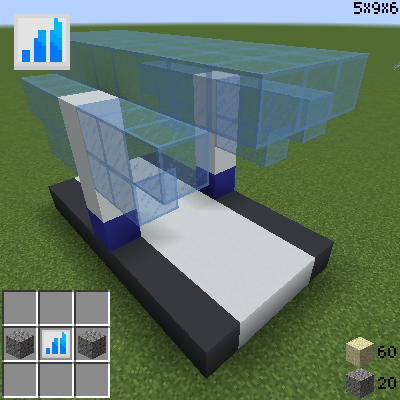 -The blocks of advanced constructions have been changed (a little). Now are orientable. Thanks for the report, I detected the problem. 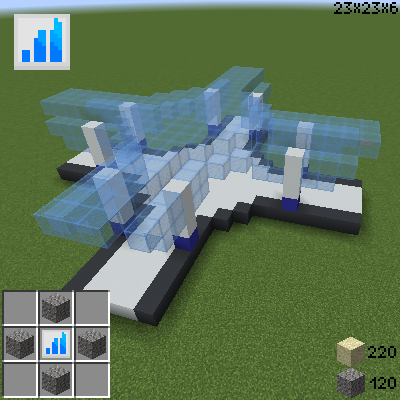 In the next hours I will update a new version with that solved. 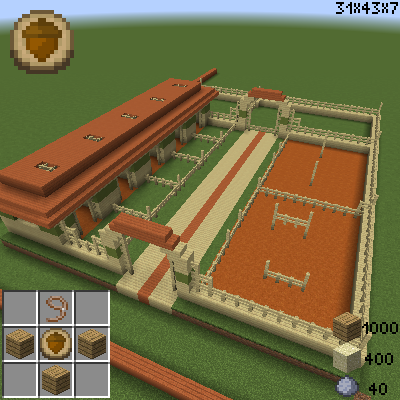 EDIT: It seems to be a problem with the forge's building process so the new version will be in the next days, with two ney buildings. 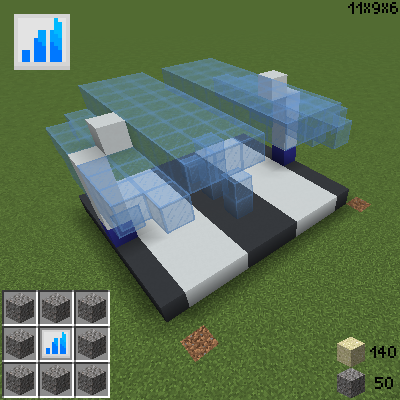 If you yant to use Archicraft in the server, the error is with a new feature of 1.3.0, so you can use the 1.2.x version. I Just updated the version 1.4.0 with that problem solved. 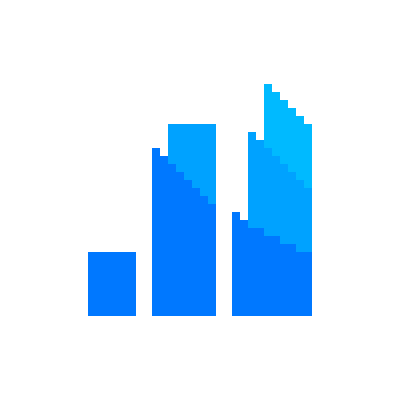 Feature Request: preview of building once Token Building Block placed, so that it's easier to place the buildings with a regard to other structures around in the area. 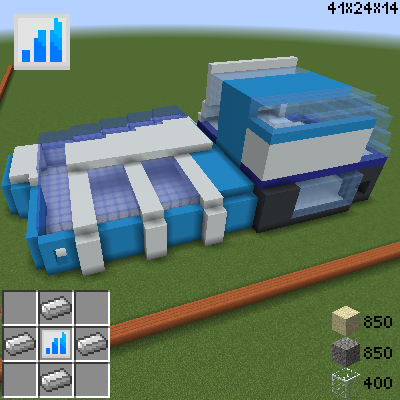 Yes, that is one of the new features of the upcoming version 1.3.0. Anyway, thanks for your request. 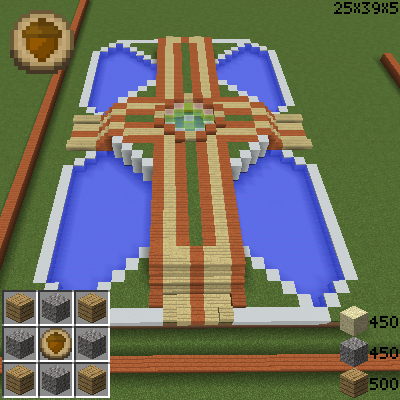 Definitely better with the outlines, but I still can't line up the Crossings with the Streets successfully. Try putting down a street and then placing a crossing so that the streets match up - nearly impossible. Crossings are perfectly symmetrical squares so the street should be in the middle. 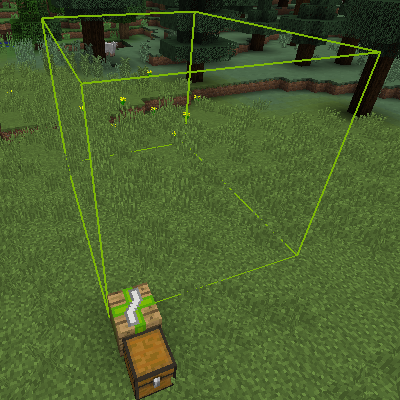 For the next update I could add a line in the middle of the outlines for a easy alignment. Wow. These are looking awesome. 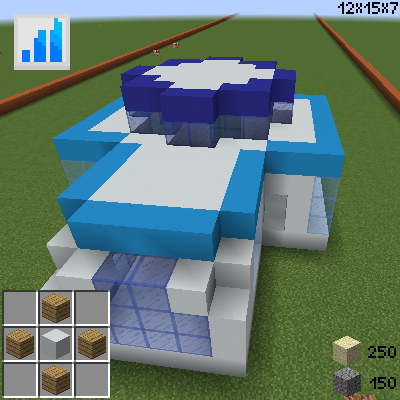 With the new jigsaw system in 1.14 this can be a great city-building stuff. 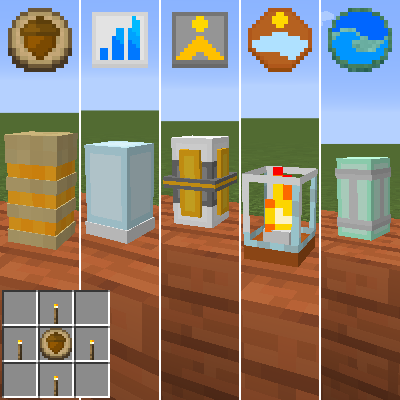 Forge don't even have a 1.13 version, so, we have to wait a little. I have got an crash log for you. 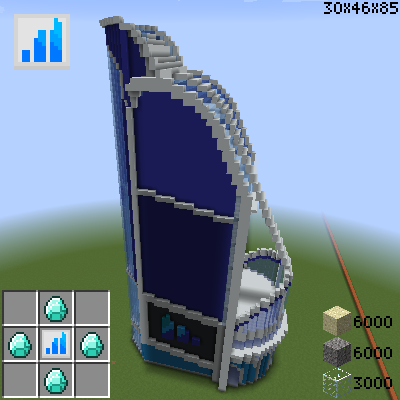 is there any other way we can rotate or adjust the building like 1 block higher or lower before finalizing to build, like we can preview how big how tall how long? Currently no, but could be a future feature. 1. 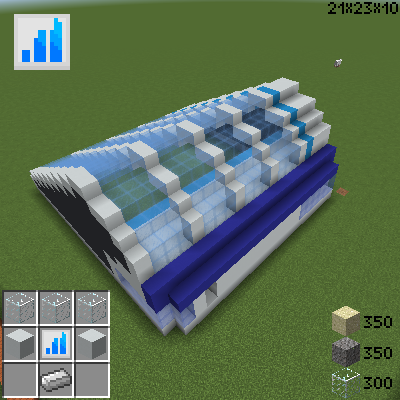 Is there a way to rotate the building or can we only build to the north? 2. 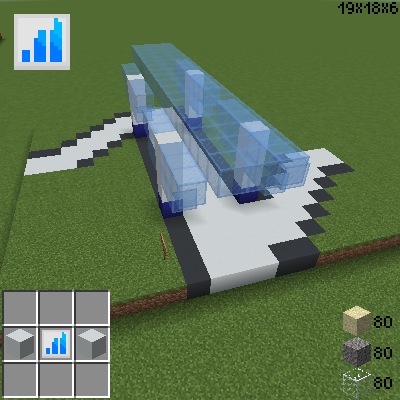 Can you replace empty blocks with air blocks, cause when build in a regular world this looks incomplete. 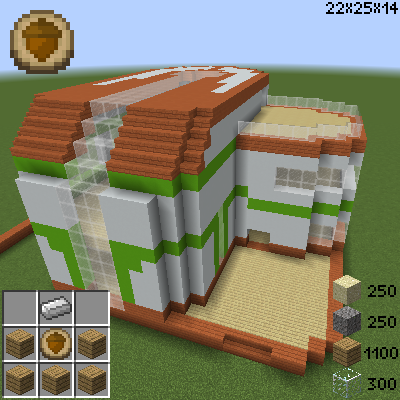 1.- You can build in any direction, only put the chest in the opposite side. nice mod... but is that brown and yellow the only color theme? Currently yes. 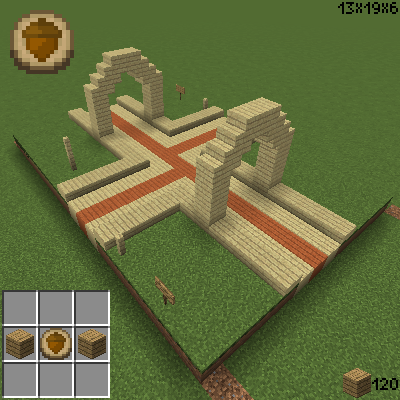 The other four achitectural styles will have other colors, materials and forms.